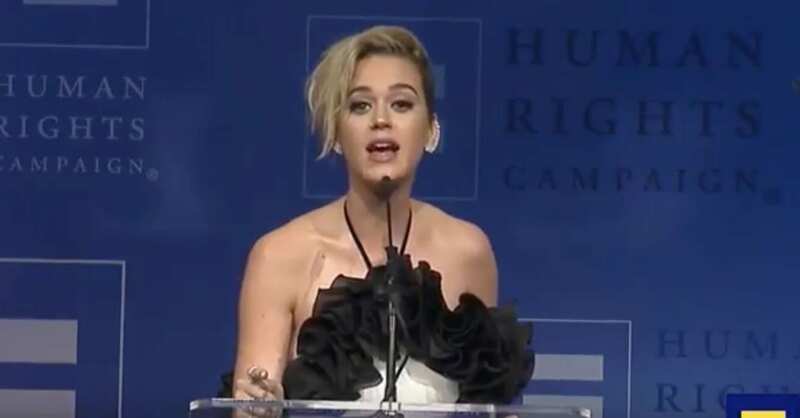 As Katy Perry accepted the Human Rights Campaign National Equality Award in L.A. on Saturday night, the singer took a “trip down memory lane” that is gaining overwhelming praise from the LGBTQ community and equal backlash from Christians. The age-old cliché that we chalk up to killing the cat has ironically become today’s “life-giving” idol, I thought. Perry chronicled the steps that led her down the path of embracing the homosexual lifestyle that her Christian roots were so adamantly against. If you’re anything like me, just her first few quotes are enough to make you cringe. So as she continued, admittedly, my mind initially couldn’t help but combat/complement each sequential statement with a Scriptural snippet. “When I was growing up, homosexuality was synonymous with the word ‘abomination,’ and ‘hell,’ a place of gnashing of teeth, continuous burning of skin and probably Mike Pence’s ultimate guest list for a barbecue. No way, no way. I wanted the pearly gates and the unlimited FroYo toppings, so most of my unconscious adolescence, I prayed the gay away at my Jesus camps—but then in the middle of it all, in a twist of events, I found my gift, and my gift introduced me to people outside my bubble, and my bubble started to burst. These people were nothing like what I had been taught to fear. They were the most free, strong, kind and inclusive people I have ever met. They stimulated my mind and they filled my heart with joy, and they freaking danced all the while doing it. These people are actually magic, and they are magic because they are living their truth. Then, after I got off my holier-than-thou preaching pedestal where I spewed not even remotely theologically sound or comprehensive scripture refutations, something hit me. We could all probably spew out about 10 million reasons why Perry’s assertions are biblically off-base and downright offensive. But that horse has been BEATEN and this issue certainly isn’t going away, so I figured I could either choose to bash the obviously blasphemous statements along with the crowd, or try to understand what they’re rooted in, in hopes of effecting cultural and Christ-like change. So as I bit my lip during the “hip-hip hoorays” for homosexuality, I started to evaluate Perry’s “trip down memory lane” from a deeper perspective. What occurred to me is that Katy Perry has heard ALL of this before, as many members of the LGBTQ community have as well. They’ve heard the hellfire and brimstone message, the Bible verses, that God hates homosexuality, that He created them male and female in His image, and that His way is the only way. They’ve heard it, and guess what?—it hasn’t changed a thing. Now, hear me out. I certainly don’t want to turn this into a church-bashing session either, as I know there are Christians who have done an admirable job of exemplifying what it looks like to love the sinner and hate the sin. There are also Christians who battle with homosexuality themselves. And on the flipside, there are homosexuals who have been graciously presented with the gospel, and welcomed with opened arms—while still choosing to reject its Truth. Ours is both a God of mercy and a God of judgment, and those choices will hold eternal consequence. But that calls for a whole different conversation. All I would like to do today is present a little food for thought for those who, like me, may be a little too quick to jump on our Christian high horses. Instead of charging that the LGBTQ community “pray the gay away,” let us reach out with the same love our Savior has shown us, who have sinned against Him in equal capacity. I pray we start there.